I was offline for a bit. And now? Here I am! Back again. I’m working my way through the paper edits of The Trouble with Necromancers. I’ve forgotten how much I like editing on paper. It’s so tactile. In Coffee and Ghosts news, I have all the large print editions available. You can find them most easily on Amazon and Barnes and Noble. Not only that, The Complete Coffee and Ghosts is now live on all vendors (and in print). You may have noticed that I didn’t do a launch for this box set. My goal is to (hopefully, eventually) snag a BookBub featured deal on the set. But for now, it’s selling quite well on Barnes and Noble. Also? I took the plunge (again) and signed up for the Iowa Summer Writing Festival. So. Very. Excited. They look like they’re about to drop an album … or take a nap. Somehow (and I’m not sure how), I made it through the first round of edits on The Trouble with Necromancers. I managed to cut ~6,500 words in the process as well. Yesterday I printed the whole thing off, and I will do this next edit on paper. While I’m doing that, I will also revisit the series structure, because changing up the first book means all the others change as well (like so many falling dominos). I also managed to get the second Coffee and Ghosts book into large print. This coming week I hope to finish up the third, and then I may just tackle hardcovers. I’ll let you know how that goes. Is it War and Peace or Coffee and Ghosts? Another week where I make all the things. Well, two things. 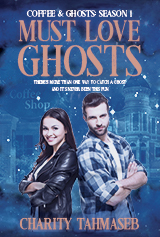 I received proof copies for both The Complete Coffee and Ghosts and the large print version of Must Love Ghosts. Just look at the size of The Complete Coffee and Ghosts! It’s like War and Peace, only with a lot less Napoleon and the burning of Moscow and more … coffee and ghosts. I’m also pleased that I can create large print editions now as well, and one of my goals for this coming week is to get books two and three into the large print format. This week, I also did some more revision work on The Trouble with Necromancers. Not only that, but I tackled the taxes, and they’re (almost) ready to go to the accountant. Not a bad week here in blustery, snowy, cold Minnesota.